With the public eye turned to Ferguson, police brutality, and murder; and in response rebels shutting down transportation infrastructure across the country– cops are shook. So it’s only right that NYC ABC heads back to The Base for our every-other-week Political Prisoner Letter Writing Dinner— with a focus on two comrades targeted by the state and its racist pigs for struggling for collective liberation. This week we will be watching videos of a couple of short interviews with, and writing to, Herman Bell & Jalil Muntaqim. Herman Bell is a former Black Panther imprisoned for the murder of a police officer in New York and is serving 25 years to life in prison. In 1971, Herman went underground because of relentless FBI attacks on the Black Panther Party. While underground, Herman was captured and extradited to New York on charges of having killed two New York City police officers. No witnesses were able to put Herman at the scene of the crime. The first trial ended in a hung jury and he was convicted at his second trial and given 25 years to life. For more information, make sure to visit freehermanbell.org. Jalil Muntaqim is a former Black Panther who, in 1971, was arrested in California with Albert “Nuh” Washington and Herman Bell and ultimately convicted for the killing of two New York City cops. In 1974, Muntaqim was convicted and received a prison term of twenty-five years to life. *Address envelope to Anthony Bottom, address letter to Jalil Muntaqim. 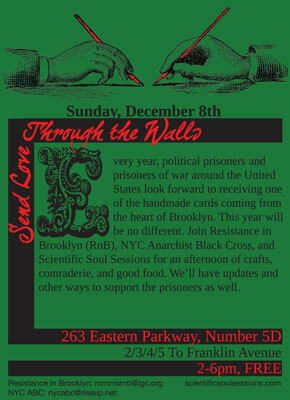 In what many prisoners have told us is their favorite event of the year, Resistance in Brooklyn, NYC Anarchist Black Cross, and Scientific Soul Sessions again join forces to bring you the annual holiday card-writing party for U.S. held political prisoners and prisoners of war. This event is always a lot of fun, the food outstanding, the camaraderie lively, and the handmade cards flat out amazing. This year will be no different. So plan to bring your friends, your creativity, and a healthy appetite. We’ll have updates on the pp/pow campaigns as well as paints, markers, crayons, and envelopes.